Hello, and welcome to the Graveyard Shift! Hosted by Kotaku's readers-run blog, TAY! A place to talk about anything, be game related or life! So feel free jump into the ice breaker topic or not ¯\_(ツ)_/¯ Maybe check the random blips of TAYCLASSIC. Either way, this is for you! The Late Night/Early Birds/ Old-World/ Citadel Shoppers/Sickbed /Office Drones/ All-Nighter/ future warriors! So instead of thinking of the unknown future, let us remember of some fun times. No, not during last year, but further back... but not that far back, cuz that's gross. Nah, to times when we were all young(at heart or not), and just got into a particular phase of certain games. 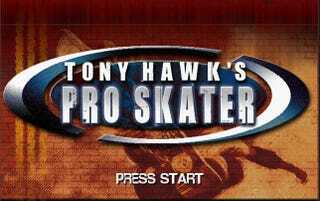 Like in the early 2000s, at least for my bro and I it was the Tony Hawk's Pro Skater game that came out. There was something more interesting about doing it virtually than busting your balls on the streets. That, and playing a good o'l local game of horse. That kinda launch a period just like the CoD craze later on. But the beating of the dead horse wasn't as bad per say. Fun times nevertheless. OH and teck deck dudes or whatever they were actually called... you know those mini skateboards but for your hands! So fellow TAYjams, are there any series you fell hard for early in your gaming life, and fondly look back on? "The Graveyard Shift is not responsible for Armageddon"